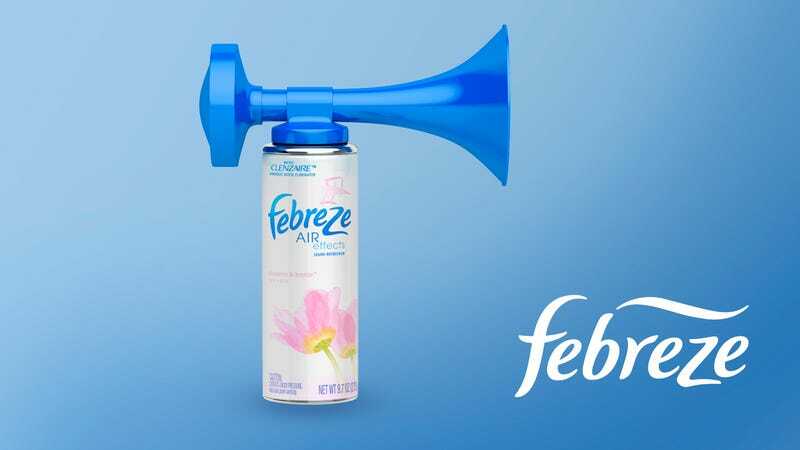 CINCINNATI, OH—Calling the device the perfect addition to any bathroom with loud acoustics or thin walls, Febreze officials announced Wednesday that the company had released a new air horn for covering up unpleasant bathroom sounds. “Pesky, embarrassing bodily functions are simply no match for Febreze’s new ThunderClap Air Horn—just one deafening blast, and that’s all anyone will hear,” said company spokesperson Clara Jung, adding that their product’s specialized, high-pitched siren was specifically designed to hide reverberations up to volumes of 15 decibels. “From routine bathroom sounds to something as loud as a groan, Febreze’s new air horn can mask it all. That’s because Febreze’s patented air horn goes deep and emits sound waves that don’t just cover up the noise, they also deafen everyone around it.” At press time, Febreze announced plans to release an accompanying plug-in air horn able to fill bathrooms with a constant stream of cacophonous noise for six months at a time.